Can a hand-made layout sketched out during an informal conversation lead to one of the smartest money-saving solutions SMI has ever designed for a customer? 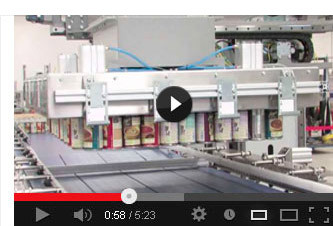 That's what actually happened for the packaging line with built-in pal/depal equipment delivered to the Idaho processing facility of Amy's Kitchen Inc., one of the largest organic and non-GMO food producers in the US. 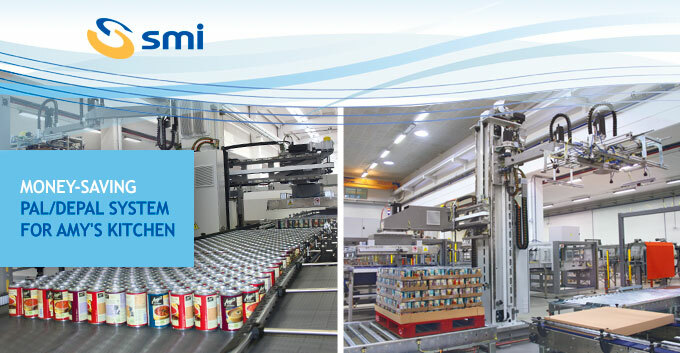 The highly innovative technical solution provided by SMI takes avantage of the flexibility and versatility featuring two Smipal palletisers, a Smiflexi shrinkwrapper and a smart network of Smiline conveyour belts connecting SMI machines to the facility's cooking room, with advanced control technology to automate it all. Thanks to this multitask system, Amy's can now benefit from huge money-saving operations, since the cooker doesn't have to stop due to packaging interruption, thus preserving the product quality. This system also allows Amy's to stack items and package them at a later time, allowing the reduction of staff on the line since it can run in one shift only while the cooker keeps working. To find out more about SMI's latest developments in this field, please contact our sales department.